Who doesn’t love a theme park? Any opportunity to wander imaginary worlds, that miraculously dissolve from spaceship to haunted house, is something to appreciate. Cinema has had many theme park endeavours and (ignoring Beverly Hills Cop 3) focusing upon Jurassic Park, Westworld and Pirates of the Carribbean, it has often worked out. Disney’s Tomorrowland has bags of ambition, and even boasts an outstanding director to helm the project in Brad Bird. Screenwriter Damon Lindelhof and older gent George Clooney would surely certify the film as a must-see. But Tomorrowland, unfortunately, seems to be away with the fairies and in another world entirely – and not the “making-sense, desperate-to-go-back” type of world we hoped. Opening with Clooney’s grizzled face, talking to us directly, it is immediate that the quirky humour seen in The Incredibles and Mission Impossible: Ghost Protocol is at play here. Interrupted by an off-screen voice, he is asked to reframe and adjust his story to give a more positive spin. This witty little introduction outstays its welcome. As, after revealing Frank’s (Clooney) backstory, another interruption begins Casey’s (Britt Robertson) backstory. This stunted beginning only serves as a rocky start and soon enough we are moving faster. ‘Tomorrowland’ is an alternate universe, whereby the greatest scientists, artists and geniuses experiment and develop inventions that eventually trickle back to us. But this world, and our world, has a ticking time-bomb which Casey apparently holds the key to. She is the one person who may be able to stop both worlds from destruction and, with the help of Athena (Raffey Cassidy), a forever-young recruiter of Tomorrowland, they work hard to get back, and stop the doomsday from even starting. A strong core, reminding us how the future is in the hands of the next generation, Tomorrowland aims high but fails to stick to the simplicity of its tale. Or at least it fails to deliver the driving themes in a concise manner. Casey, channelling a Jennifer Lawrence image via a snarky, bolshy exterior is ultimately difficult to like. An early scene shared with her father finds her glibly reiterating advice he gave her, back to him, as he faces a forced change in career. Athena, her happy-droid companion, is equally a smarty-pants, as she comfortably shuts down after becoming bored with Casey’s understandable questioning. Finally, Clooney plays Frank as a bit of a loner grouch. He is resentful of the way his own experience in Tomorrowland turned out and is initially reluctant to be involved at all. This would play well against more charming teenagers, but alongside this smug troop, it only manages to bolster a sense of superiority that’s difficult to appreciate. With the three leads failing to capture our imagination in their own telling of the story, it is difficult to truly enjoy the narrative track that we are on. But, amidst these failed characterisations, many set-pieces and action-sequences are thoroughly enjoyable. The initial flashback to the 1960’s sets the scene in an Edward Hopper/Mad Men locale that oozes class. The jetpack is fun and wild too – making the same gadget in Thunderball look like a dull alternative. In fact, Casey’s first visit to ‘Tomorrowland’ is the film we want to see more of, making it thoroughly depressing when she awakes trudging through a dark lake. Whether it is the rickety house that houses fast-shutting metal-doors, lasers and Thunderbirds-like secret-slides, or the ‘Mr Anderson’-type villains, with permanent smiles and pseudo-positivity, it is clear that families will devour these scenes time and time again. Disney – and Brad Bird’s team at Pixar – always manages to balance childish-adventure with adult-references seamlessly: Tomorrowland is no different. You’ll recognise the Terminator 2 nod and there is a barrage of nerdy ‘easter eggs’ in the ‘Blast from the Past’ comic book shop. Brad Bird remains an exceptional filmmaker, and you can sense that he knows how to make Tomorrowland brighter and more unique than the crop of blockbusters currently on display. But the story is what holds little weight and rather than innovate and inspire children to be the future, Tomorrowland almost hints at burying our heads in fantasy, as the world descends into chaos around us. 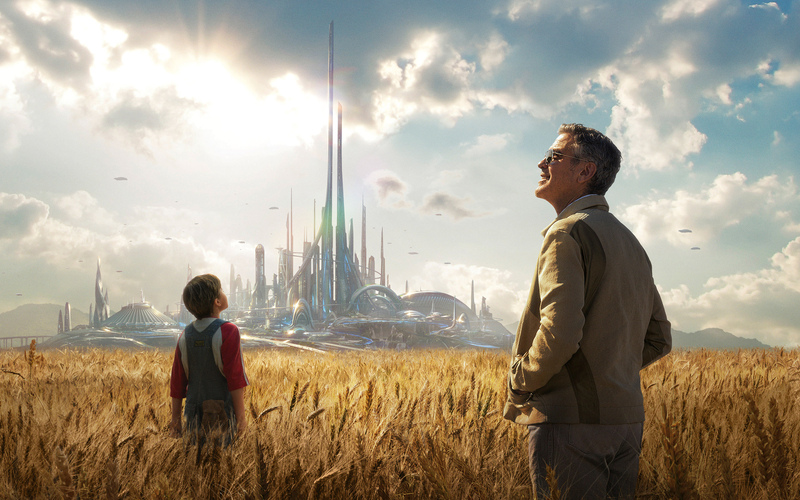 Surely ‘Tomorrowland’ needs to feel like the future, rather than an impossible dream.